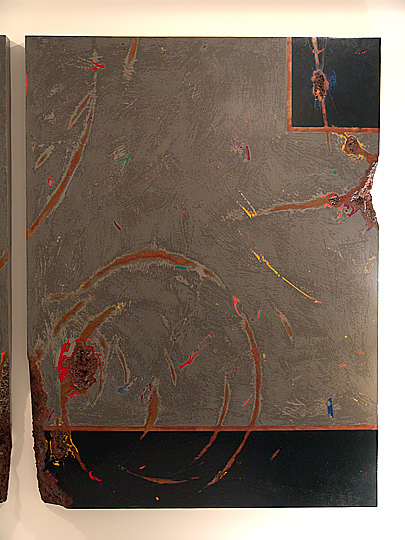 A diptych (pronounced "DIP tik") is a work of art that is made up of two separate paintings which together form a single work. 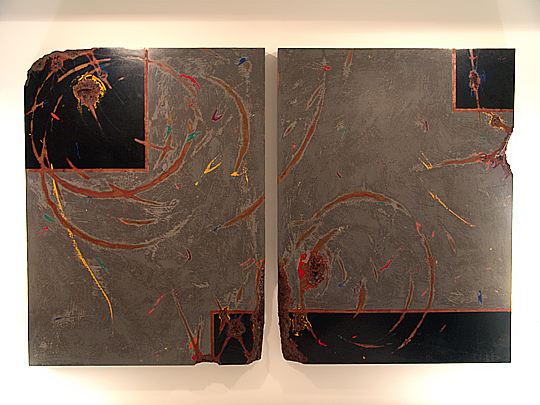 This diptych by Delos Van Earl is truly a powerful work of art. To create this work, Delos started by creating the two steel panels by hand, welding together the various plates of steel. 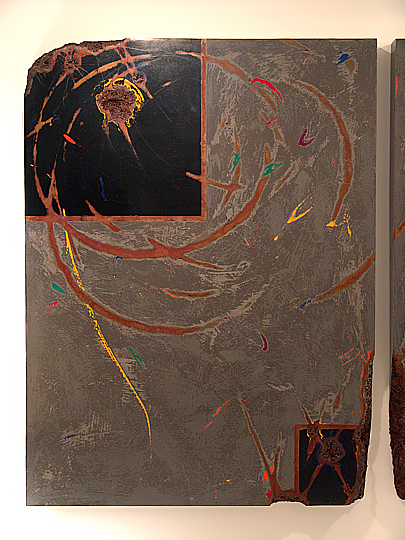 (Although this work is two inches deep, the panels are not solid slabs of steel. They're hollow.) Then, he attacked them with plasma torches and sanders to create the effect of corrosion and wear. He painted multiple layers of color, which he then abraded down again... in effect, he created brushstrokes by wearing away one layer of paint to expose another. In places, he went right through all of the paint and exposed the bare metal beneath. Finally, he added a thin layer of sealant to each panel to prevent corrosion. The result of all of this work is very cool... a metal sculpture that appears and behaves like a traditional painting, but in which the influence of the metal remains strong. With its somewhat simple geometries, this work reminds me quite a bit of the colored rectangles for which Piet Mondrian became well-known, but with a more industrial feel. I've always been a fan of abstract art (see: Bob Rankin), and this work is a great example of what you can do with material, shapes, and color. These two panels were each so heavy (I'm sure they weigh over 100 pounds each) that Renee George Gallery had to arrange for them to be professionally installed... they're hanging over my bed, and they really do make a powerful statement. I'm quite glad to have Fog Bank Diptych in my collection.